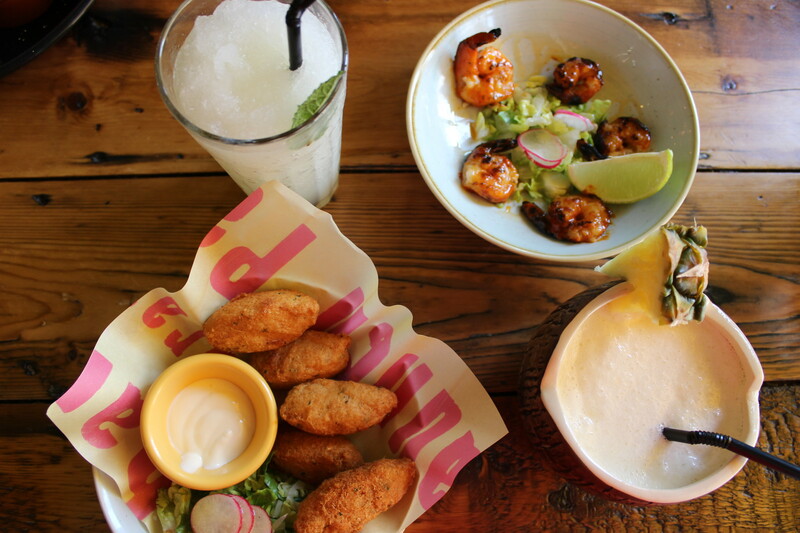 Last week, I was invited to experience a Cabana Night Out – an evening of entertainment, food and fun, kicked off at Cabana Islington, before heading off to the nearby Sadler’s Wells theatre to watch their new dance extravaganza, Voices of the Amazon. I’d never been to Cabana before (and one just opened in my home city, which is awesome), so I was really excited for my first visit. 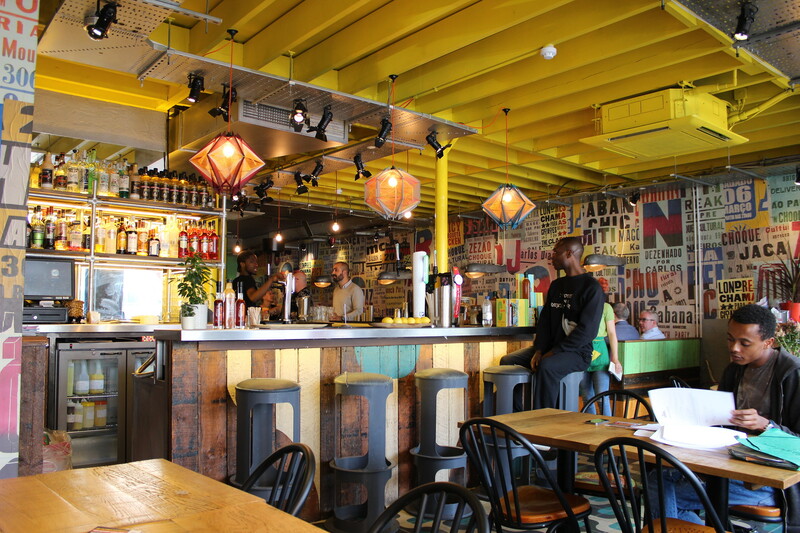 The location had relaxed, upbeat tropical vibes – denim clad booths and old oil drums painted bright yellow, light fixtures made of sun hats, tin cans bristling full of herbs, and blue ’60s style tiles. Think upcycled, urban, ecclectic chic with heavy tropical colours. 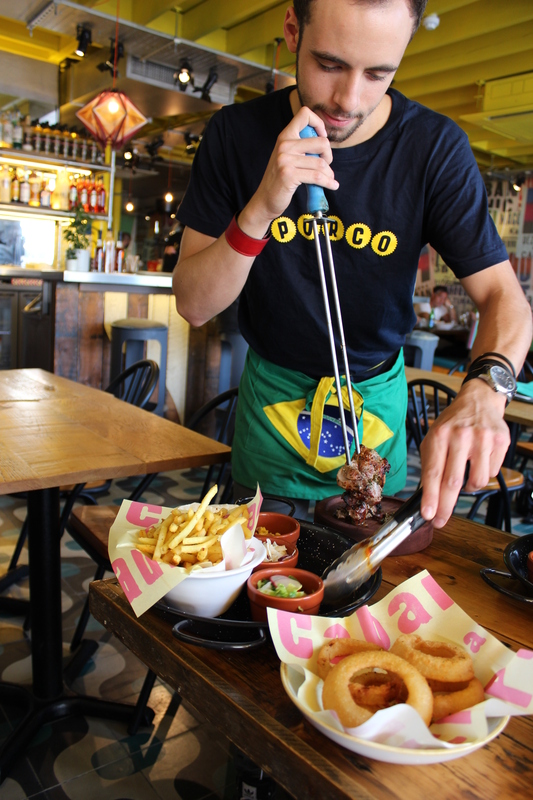 The menu begins with Rio street food, goes through to a variety of skewers, salads, burgers and curries, and ends in a calvacade of chocolate, caramel, cream and fruit. 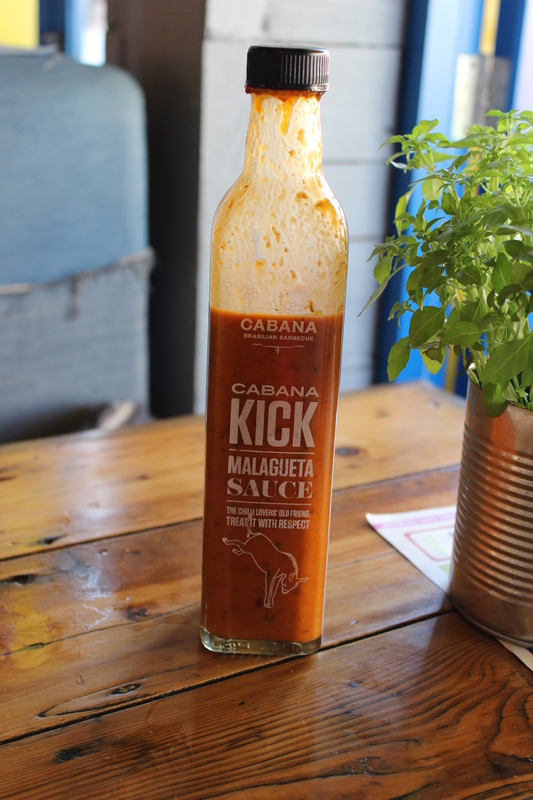 Cabana’s food is bright, vibrant, and the signature sauce – Cabana’s Spicy Malagueta – epitomises their approach to food – smoky, saucy, spicy, piquant and exciting. To start, we had the prawns, which were perfectly chargrilled with the aforementioned Spicy Malagueta sauce. Smoky, sticky, and juicy, they were some of the nicest chargrilled prawns I’d had in a long time. 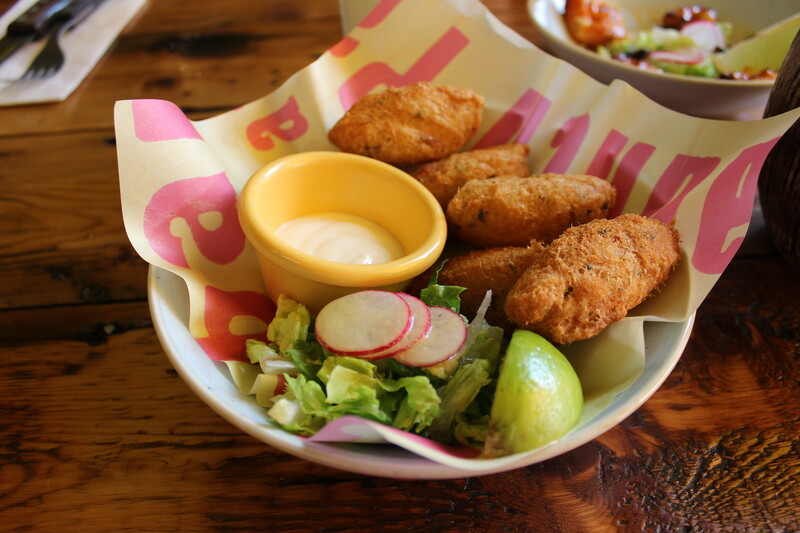 We also had the salt cod fritters: the perfect ratio of crispy fried exterior and creamy salty interior. 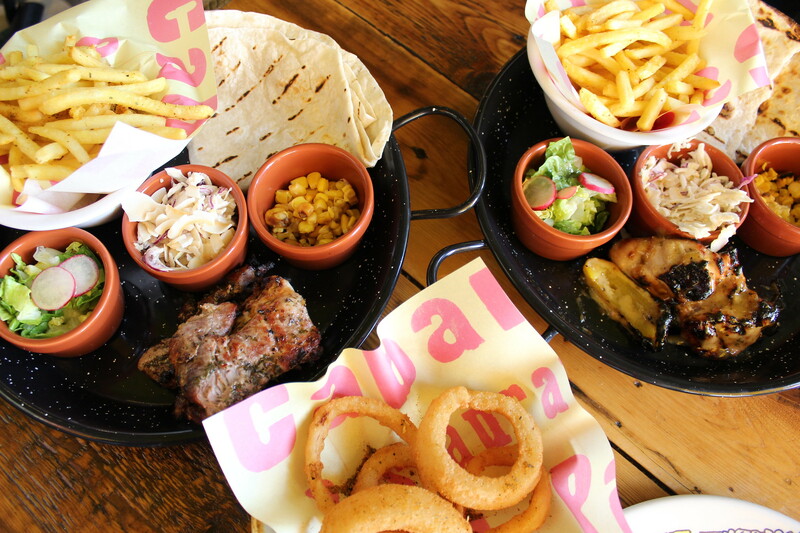 For the mains, we ordered some of Cabana’s famous skewers. 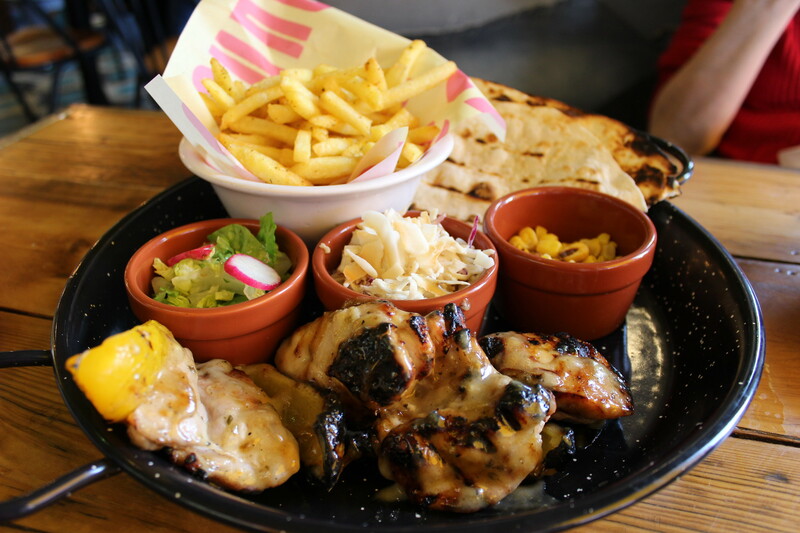 You select your chosen meat and seasoning from the menu, and a plate arrives with flatbread, coleslaw, salad, corn and fries, before your meat is brought out and ceremoniously relocated from its skewer onto your platter. We chose the tenderloin of pork, and the zingy garlic and lemon chicken, which was coated with a thick, slightly sweet and sour sauce that was heavy on citrus, with the garlic taking a back seat. Of the accompanying sides, the slaw was the standout, with a crisp coconut topping that added a creamy, nutty flavour. The fries were perfect – thin cut, bristlingly crunchy, with a depth of flavour that only comes from generous seasoning. The accompanying sweetcorn was served chargrilled and cold, which added an extra nutty layer of flavour, and I loved the sweet, soft flatbread on the side, too. My top tip? 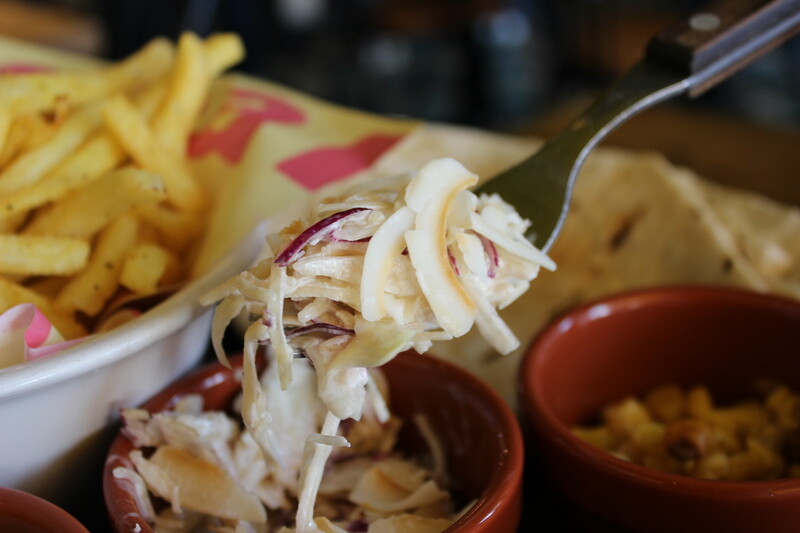 Make yourself a wrap and add plenty of coleslaw, Malagueta sauce, coleslaw and your meat, and enjoy – it’s sublime! 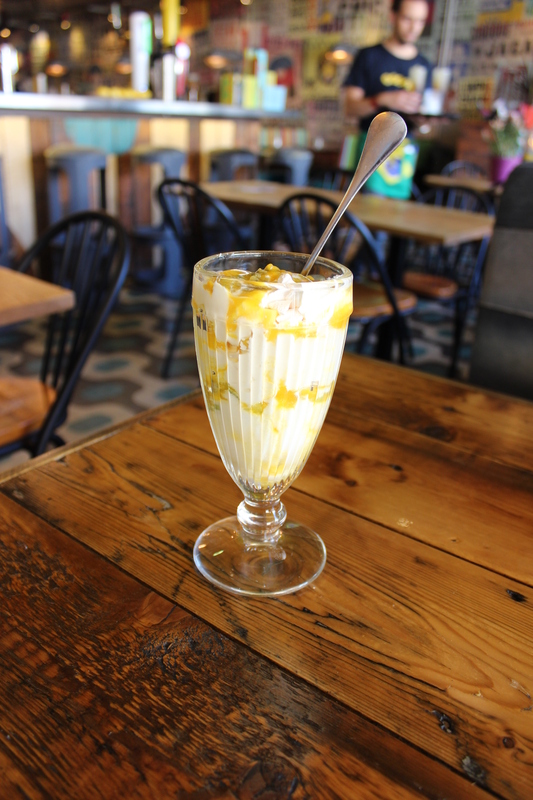 For dessert, we enjoyed the churros and a big helping of Brasilian Mess – a take on one of my favourite puddings but with fresh mango, passion fruit and kiwi instead of strawberries. 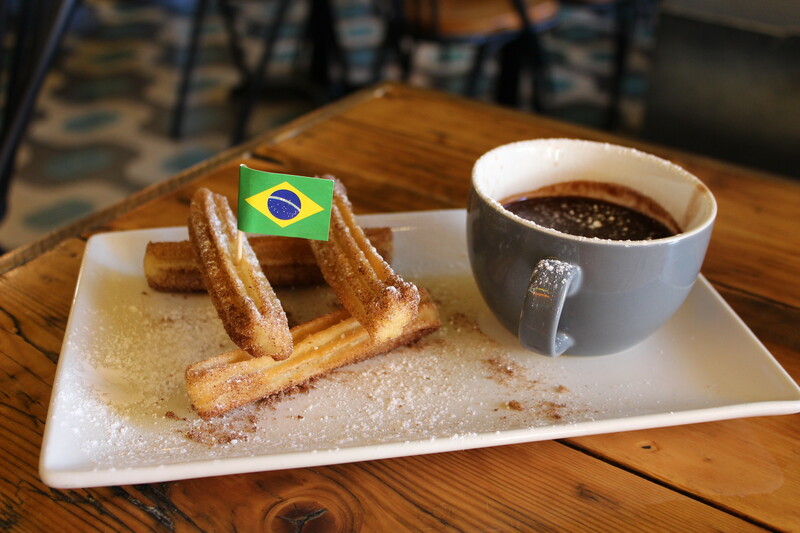 The churros were perfect, and my dining companion (my lovely mum!) said “If I was a doughnut connoisseur, I’d give these 6 out of 5.” Well, I have to say, my mum’s most definitely a doughnout connoisseur (she knows what she likes, and she’s very particular), and so that score is official. 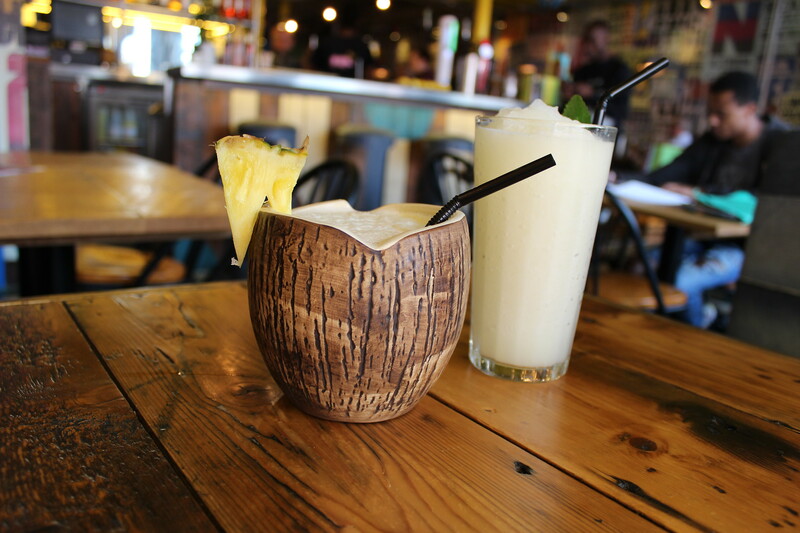 Cabana’s locations are so near some of the best entertainment venues the UK has to offer (with our local being very close to the Showcase Cinema de Luxe, and of course, The Mayflower theatre). The street food menu means you can quickly grab a spread of Rio-inspired tapas for a post-gig rundown, or go for a pre-theatre three-courser like we did. And of course, the amazing range of cocktails is the perfect way to round off the night too. I really loved the party atmosphere of Cabana and it made a perfect start to a wonderful evening. Cabana Islington is around a ten-15 minute walk to Sadler’s Wells (depending on how many cocktails you’ve had already, of course), where we went to watch the incredible show Voices of the Amazon, from Sisters Grimm and narrated by Jeremy Irons. 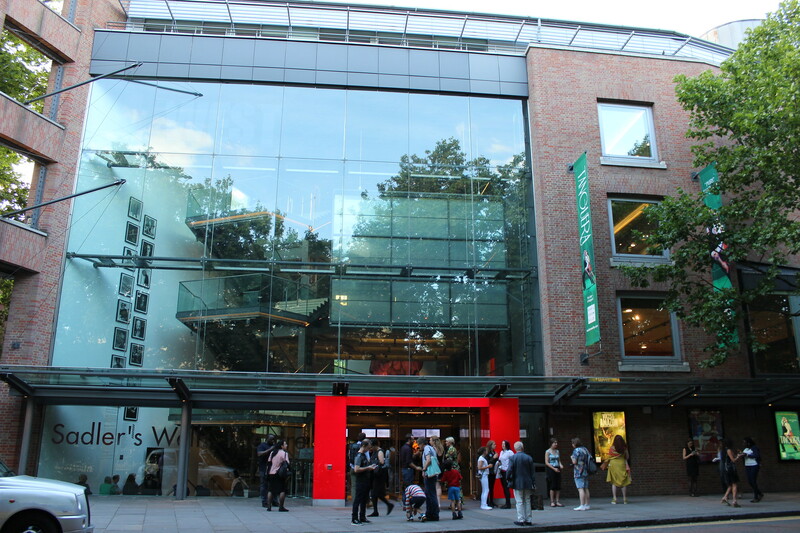 Sadlers’ Wells is a fantastic, modern venue (with great bars, need I say more…? 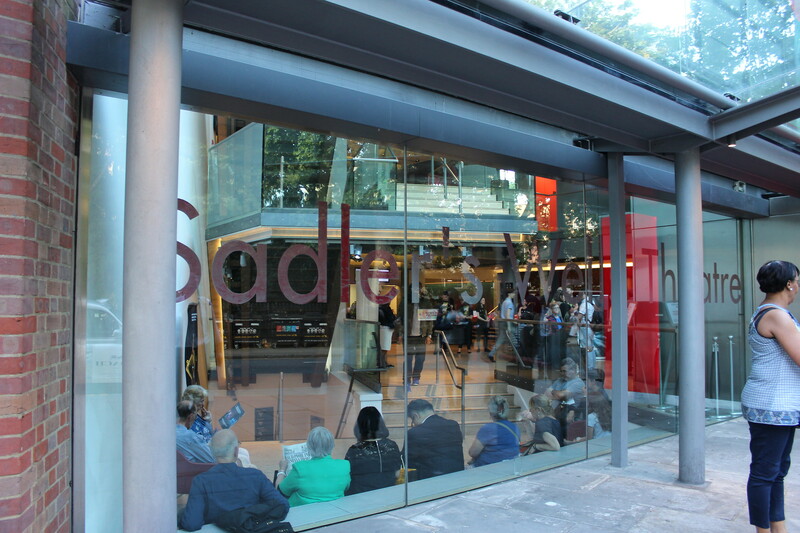 ), comfy seating and an intriguing roster of upcoming shows, which you can see here. 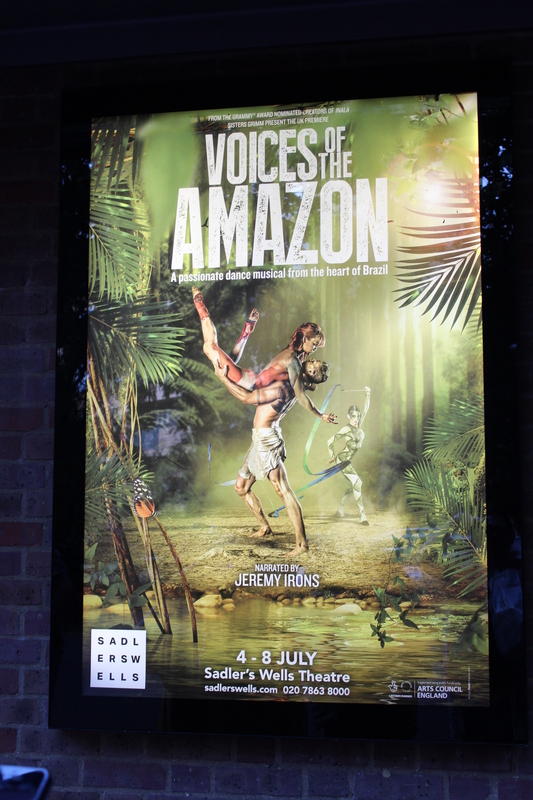 Voices of the Amazon featured some incredible talent, including Royal Ballet’s First Artist Nathalie Harrison, and fused together a gorgeous Brazilian musical score with elements from ballet, capoeira and contemporary dance. With a minimalist backdrop and searing vocal talents from Kay Elizabeth, the show took us from deep inside the Amazon river, through to the Amazon rainforest, with peril, drama and very real, human emotions. The costuming by Temple Clark was incredible, especially when depicting the colourful birds of the forest (who also had their own dance movements which were beautifully realised by the performers). The show is best described as an eco-fairytale, with strong messages about respecting the natural world, and its sometimes devestating power. Irons’ narration was essential to the story, and his dulcet tones added great drama and theatre to the proceedings. 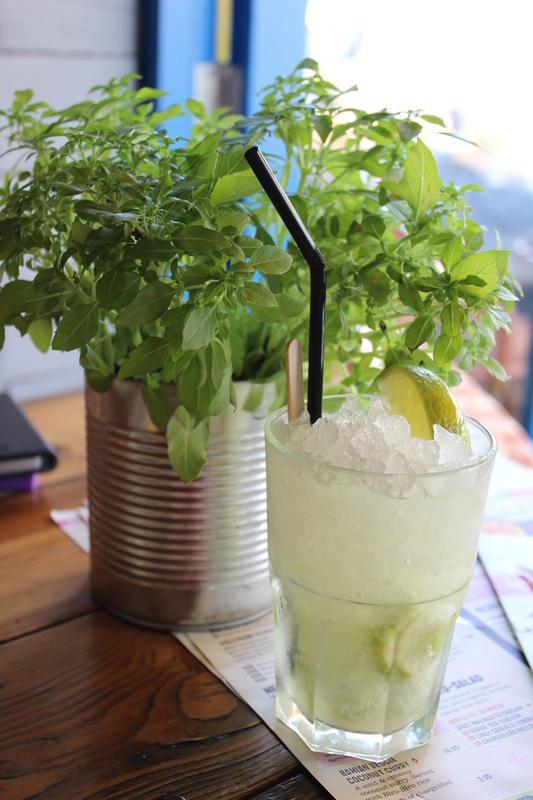 It was the perfect way to end our Cabana Night Out – although I would have happily returned again to Cabana Islington just for another round of cocktails! 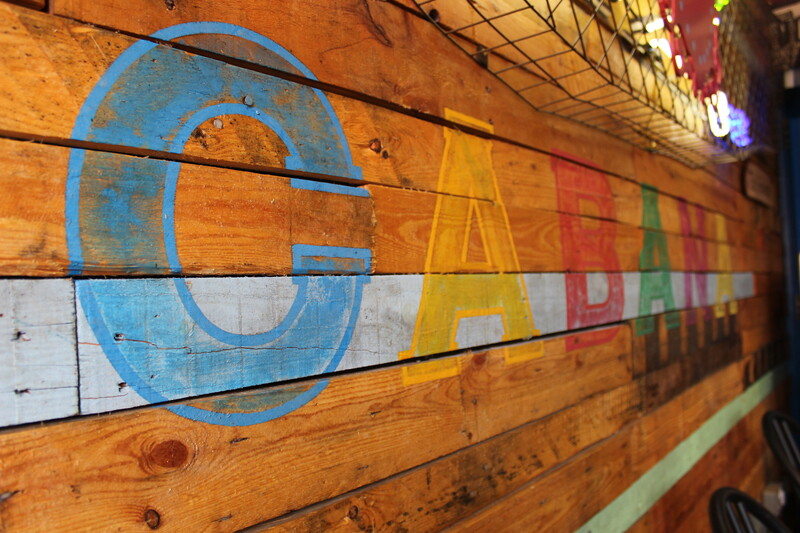 To kick off your next night out, visit Cabana’s website here, to find your local Cabana and read the menu!